Of the five trends described in a report published by Kalorama, only two made the list in both 2015 and 2016: Consolidation within the IVD industry and growth in molecular point of care. What a difference one year can make in the most significant trends influencing the in vitro diagnostics (IVD) industry, which also influences clinical laboratories, the largest customers of IVD manufacturers. 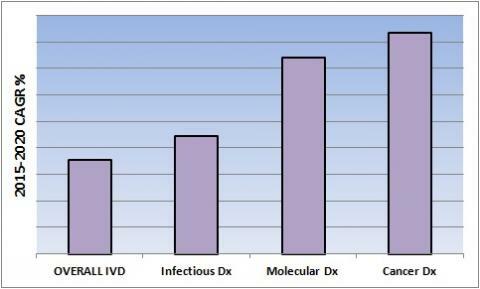 These insights come from comparing the top five IVD trends for 2016 as identified by Kalorama Information compared with 2015. Expect More Acquisitions from Heavyweights: The increasing complexity of in vitro diagnostics is one powerful force encouraging IVD companies to do acquisitions, partnership deals, and distributor agreements as a way to bring together all the technology parts they need to compete. Expect to see plenty more of these types of deals in 2016 as companies scramble to obtain all the technology and resources needed to achieve their goals. Pragmatic Personalized Medicine: Pharmacogenomics (PGx) studies how an individual’s genetic makeup affects how they react to certain medications. Kalorama notes that there are currently more than 50 PGx test products in development or already on the market. Tests for infectious and hereditary diseases should continue to improve, as well as further advancements in oncology. Government projects from 2015, such as the Precision Medicine Initiative Cohort Program should also improve the dynamics of PGx testing. Emerging Disease Threats: International travel, trade, and climate changes are contributing factors in the emergence of diseases in developed countries that were typically found only in the tropics or the developing world. The recent Ebola risk made the American public more aware of a pandemic disease threat. Infectious diseases like malaria, Chagas Disease, and Dengue Fever can now appear anywhere on the planet, infecting humans, animals, and insects. These types of diseases can be difficult to prevent and control, making their existence a public health concern for the world’s population. Molecular POC Becomes Reality: Multiple companies, including Alere and Cepheid, have recently introduced analytical instruments that can perform rapid molecular analysis in near-patient settings. Products that advance infectious disease testing into the point-of-care (POC) arena, allow healthcare providers to begin essential treatment during the same visit or day. For example, the Alere i Influenza A & B platform delivers molecular flu results in less than 15 minutes. And, at a mere nine inches tall, Cepheid’s GeneXpert Omni, is the world’s most portable diagnostic system. It provides unprecedented access to accurate and fast diagnosis of tuberculosis, HIV, and Ebola. Cancer, Molecular, and Infectious Disease Drive Sales: The research firm identified “the fastest-growing and most critical areas of clinical diagnostics: cancer diagnostics, molecular assays and systems, and infectious disease tests. Together, these three IVD areas represent approximately 40% of the overall IVD market.” Authors of the report noted that, combined, these IVD segments are outgrowing the overall IVD market by more a compound annual growth rate of 2%. The sub-segments of the cancer and molecular diagnostics markets are doing even better, growing at more than 8% each year. Energetic Competitive Activity: In 2015, there was plenty of activity in the IVD market, including acquisitions, partnership deals, and distribution agreements. Roche Diagnostics, the diagnostic division of Hoffmann-La Roche, remains the world’s largest supplier of clinical diagnostics with sales almost doubling their nearest competitor. Netherlands-based Qiagen (NASDAQ:QGEN), a global provider of sample to insight solutions, has experienced close to a 30% increase in sales since 2010. IVD companies continue to experience robust growth as the larger companies jockey to increase their market share and expand their company’s offerings of IVD products. Information Technology and Genomics: Data sharing has become a vital and important tool that enables the medical research community to aggregate their knowledge on diseases and actionable findings. With hundreds of genome studies underway, information technology (IT) helps researchers share data to better understand the role of specific gene variants in disease processes. Large databases of lab test results, gene sequencing data, and other types of healthcare statistics are amalgamated to identify useful information that can lead to timely and more accurate diagnoses along with more informed therapeutic decisions. Original source was written by JP Schlingman.